Unfortunately, other houses I have seen of his, I don’t have photos of, but he loves his timbers, and asthetics. He works well with Keith and has been a great teacher. 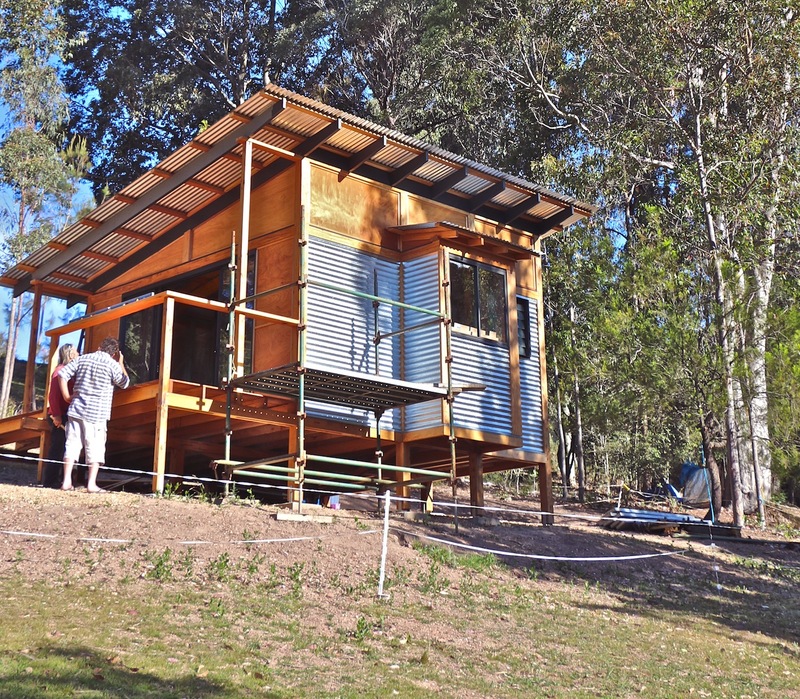 With no power, a generator was essential, under the shelter of a beautiful Spotted Gum. Yay! First Cypress Pine posts. Before we could contine, the floor had to be braced. It could have been done in various ways, but this was a robust attractive way that appealed to both builder and owner. This is the western wall. What you see here is the kitchen window in the centre. On the south side of the window is the bathroom, on the north side the lounge/bedroom. The interior is still incomplete, but some furniture has already been bought, along with the kitchen sink. Right side of the bed is the entry to the bathroom. Left side of the bed a cupboard/wardrobe. Doors will be sliding. Lily and Col’s dog Ninja love being here. Now that things are taking shape there will be more stories and pictures to come. Right now though it’s Christmas Eve, and I’ve been sitting here trying to get to know this wordpress harmonic theme again….time to get off the computer! Have a wonderful Christmas.